I slipped and slid, but secured the skiff to a rock then turned toward where I had last seen the bear. Soon as I spotted it, the bear looked back into the trees behind him, then took off a run as if being pursued by a pack of hounds! I glanced questioningly at Keegan McCarthy then back to where the bear had disappeared. Out walked a gray-colored wolf, following the same path as the bear. The wolf stopped long enough to howl before taking up the bear’s trail. I was madly trying to get into a shooting position, kneeling on barnacle covered rocks where I could hopefully get a good solid rest. The wolf disappeared just about the time I got into position for an accurate shot. 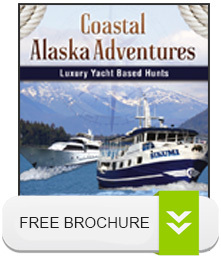 Neither Keegan, owner of Coastal Alaska Adventures, with many years of experience of hunting the coastal regions of Alaska for black and brown bear as well a Sitka blacktail deer, nor I could hardly believe what we had just seen? A black bear of size being chased by a wolf! 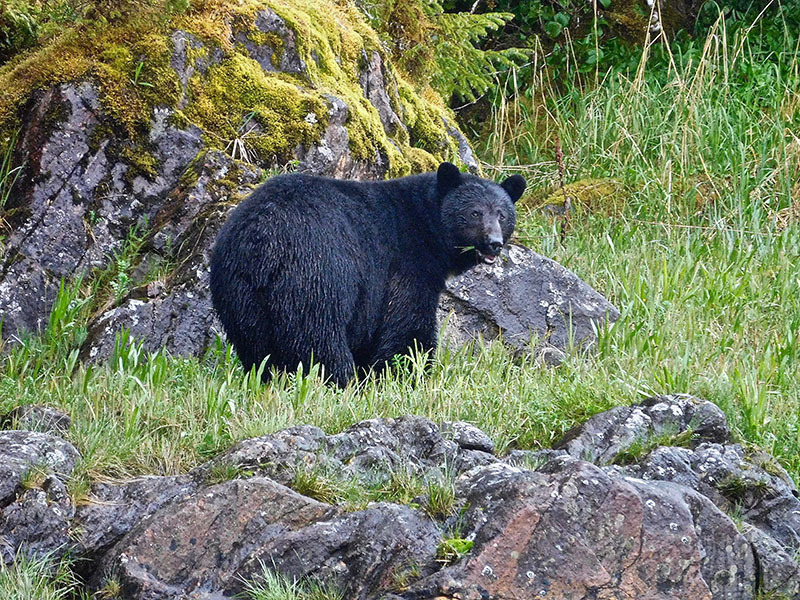 With both and bear gone, when gale force winds momentarily subsided, we jumped into the skiff and continued coursing the shoreline in search of bear coming to water’s edge to feed on the lush green vegetation growing there. Rain pelted us the rest of the afternoon. I was truly glad Drake Waterfowl indeed produced rain-proof clothing rather than simply rain-resistant garments! During our afternoon hunt we spotted several humpback whales and many different species sea ducks before heading back to the Sikumi, McCarthy’s luxurious near seventy-foot boat anchored in a secluded bay away from the ravages of wind and waves. Aboard and in the main cabin, I asked Ben and Jay Townsend, Tom Scheetz and Lou Purvis, fellow Texans about their afternoon hunt. Ben and Jay had seen bear but their guide Kurt Blades did not consider it a “shooter”! They like us had also seen a wolf chase a black bear. Ben had the day previously taken an absolute monster bear that squared a legitimate seven feet and ten inches! He was now hunting with his dad, Jay. Tom Scheetz was all smiles! He had an hour before dark taken a gorgeous, luxuriant haired black bear, his first. 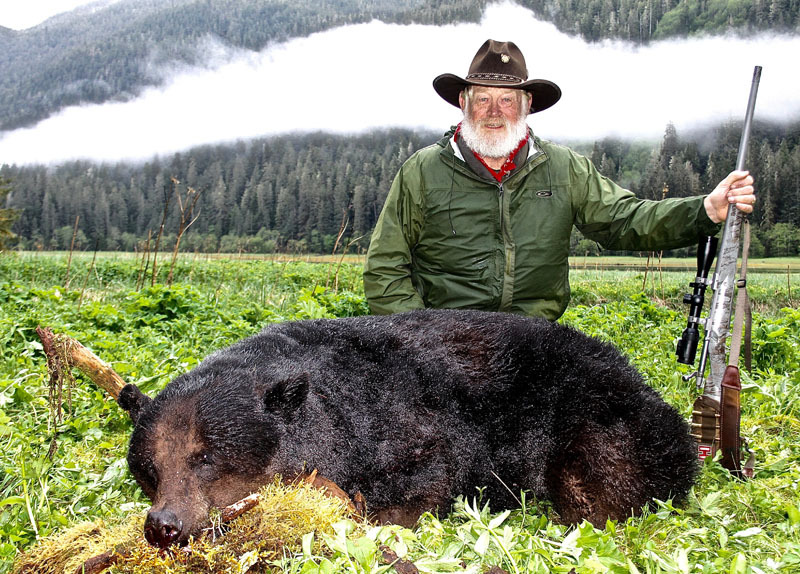 According to guides Jesse Gallagher and Logan Canton his bear would square right at the seven feet mark. They had spotted the bear from quite a distance and by cautious stalking cut the distance to within easy rifle range. Lou had flown in early that day so could not hunt that afternoon. He had accompanied Tom on his hunt. Master chef, Austin Bush, who also hailed from Texas, that night, as at every meal, set a fabulous table! It did not take long to spend the night, no different than any other hunting camp. But rather than get up early to go hunt, I got up at first light to go fishing, jigging off of the back of the Sikumi. It was the same routine I followed each morning. Those hours spent fishing provided black sea bass and an occasional halibut for the table. I also caught the most interesting looking sculpin and yellow fin sole. Great fun! We also set crab pots a couple of days which provided a bounty of delicious Dungeness crabs. One day too, we set shrimp pots. Truly some of the numerous benefits of hunting Alaska’s coastal black bears from a comfortable boat! Fishing in the morning, then bear hunting starting about noon. Those mornings also gave us an opportunity to move the boat up and down the coast closer to what Keegan and his guides considered prime black bear areas. About mid-way through our seven-day hunt Lou and his guide Logan had a most unusual encounter with a bear and a wolf. They were stalking a bear on a grassy tidal flat. Suddenly the bear took off at a dead run, coming right toward them. For a few seconds they thought the bear was charging them! But then they saw a black wolf running hard and fast nearly on the heels of the bear. The bear, which Logan later described as likely being a three or four-year old, charged past hunter and guide within less than twenty yards! Lou, quickly exchanged his bow for Logan’s Ruger rifle. The black wolf saw the movement and came to a stop. As he did, Lou pulled the trigger on Logan’s 300 grain DGX Hornady round in his .375 Ruger Guide Rifle. Down went the wolf! Two days later Jay and Ben along with guide Kurt Blades were glassing for bear in the general area where Lou had shot his wolf. They watched as a bear walked out of the dark timber. It fed on fresh green grasses and sedges. Then exactly where the bear had emerged from the woods strode six wolves. The wolves were obviously on the trail of the bear. Soon as they spotted the bear they started trotting, then running toward the bear! When the bear saw, heard, smelled or sensed them he took off at a run! The last the trio saw of the bear and wolves, they disappeared into the trees. By hunt’s end we had seen six different occasions where wolves trailed and chased black bear. Keegan, Austin Manelick, my cameraman for my “DSC’s Trailing the Hunter’s Moon” television show on Sportsman Channel and I hunted hard every day in rain, sometimes a drizzle and other times torrential! We “worked” the coastline, long bays and streams in our skiff and also on foot walking to a high spot where we could see great expanses, looking for bears. Several times during our hunt Keegan commented that the green vegetation was about a month ahead of schedule when compared to previous springs. My personal bear sightings were meager. We saw the bear previously described being chased by a wolf about mid-way of my hunt. Then there was that second evening of the hunt, just beyond an area Keegan called “the fish bowl”. Keegan, Austin and I spotted a bear feeding in a small grassy cove. We eased the skiff in closer where we could get a better look. No doubt he was a boar, a good one with a truly nice, unrubbed coat. The bear was one of those borderline boars. In another region, certainly he was a “shooter”! But here, there were bigger bears! We finally decided the bear was mature, but not one of those that takes your breath away when you see him. “Can’t shoot a eight-foot bear if you use your tag on a seven footer!” was Keegan’s comment as we watched the bear walk away. I fully agreed! As the hunt wore on, I was recalling my decision on the seven footer. Had I made the right decision? After all the footage was fabulous and we could have gotten an extremely good “over-the-shoulder” episode! But I had taken several black bear in the past including some as big and slightly bigger. This hunt I was looking for one of those bears that causes you to gasp when you see it, one to send to The Wildlife Gallery to have them do a full body mount! The more I thought about it, the more I knew I had made the right decision not to shoot the seven-foot bear! Second to last afternoon during high tide we headed into a long relatively narrow grassy creek bottom. The difference between high and low tide in the area we hunted was about twelve to fourteen feet! We were in the area where in previous years Keegan had seen a cinnamon colored black bear, one he thought would square very close to eight feet. After banking the skiff as far up the creek as possible we; Keegan, Jesse, Austin and I walked another four hundred yards through muck and mire. There we set up. Sitting high in a tree Keegan spotted movement which turned out to be two moose! The afternoon wore on. It was getting late, rain fell and the tide was quickly going out! “We can stay here and hope the big cinnamon shows up. If we do and he does we’ll have to walk about four miles to where we can call for someone to pick us up from the Sikumi. Or, we can head back and hunt our way toward home. What do you think?” asked Keegan. “I don’t guide the guide!” came my reply…. “Let’s head back to the skiff! If we see something, great, if not, we still have tomorrow.” came Keegan’s response. I had to admit I hoped that is what he would say. I did not relish the idea of sloshing through four miles of muck and mire! Back at the skiff we loaded in and started slowly moving with the outgoing tide. We stopped to retrieve a skiff that had been left in the stream the previous evening, then headed home toward the Sikumi. Moments later we were on shore down-wind of the bear moving toward where the bear fed, oblivious of our presence. We kept the fallen logs between the bear and us. Just before we could reach the logs we had to cross a narrow strip of water. I stepped in and immediately quickly sank in “muck” nearly to my waist and I still had not touched bottom. I struggled to free my left foot from the silt and tried to step forward. I started falling. Thankfully my left knee landed on a rock. This allowed me to push forward and on to the bank. Taking a deep breath, I pulled myself out of the “hole” and moved toward the the log. There I rested my Ruger Model 77 FTW Hunter chambered in .375 Ruger. I cautiously and quietly opened the bolt and seated a Hornady 300 grain DGX round into the chamber, peered through the scope and settled the crosshairs on the bear. “What do you think?” I asked fully knowing this was a BIG bear! I pushed the Ruger’s safety to fire, centered the crosshairs on the bear and then waited for him to give me a broadside shot. Seconds later he did. I exhaled all my breath as I had learned at S.A.A.M. Hunter Training, locked the crosshairs right behind the shoulder to take out the opposite shoulder, then started squeezing the trigger. At the shot the bear rocked and started to turn to run toward the woods. I bolted in a fresh round, found the bear in the scope and gently tugged the trigger. He went down! I bolted in another round and watched the downed bear through my scope. When he did not move I opened the bolt without taking my eyes off of the bear, pushed thaT round into the magazine, then put another Hornady DGX into the chamber. We quickly covered the forty yards that separated us. At the bear’s side I marveled at his size. He was huge, considerably bigger than any black bear I had taken in the past! I accepted Keegan’s hand in congratulations, then said a prayer of thanks! I looked up from the bear’s side to see Jesse bringing my western hat and my camera. He extended a congratulatory hand. After tagging and some hasty photos we decided to cover my bear with a tarp leave him where he lay. The tide was dropping quickly. If we tarried with my bear too long our skiff would be left high and dry. We would return the morrow for more photos, remove the skin and properly take care of the meat! Back on the Sikumi we celebrated my success with a fabulous dinner of Dungeness crab! Satiated and after telling my story numerous times, I headed to a welcoming shower and bed. I slept well that night, recalling the detail of my bear many times over! Last day afternoon, after meat had been properly taken care of, the skin fleshed, we laid my bear’s skin on the back of the boat. Without any stretching we measured from tip of nose to tip of tail, then left front claws to right front claws. The two measurements were added together then divided by two to determine the “square” of the bear. “Any guesses,” asked Keegan. “He’s not quite eight, but he won’t miss it much!” I replied. “Seven feet, ten inches! Jesse and Logan cleaned the skull earlier and it measures 19 6/8! That’s a HUGE black bear!” announced Keegan… There was nothing I could add! 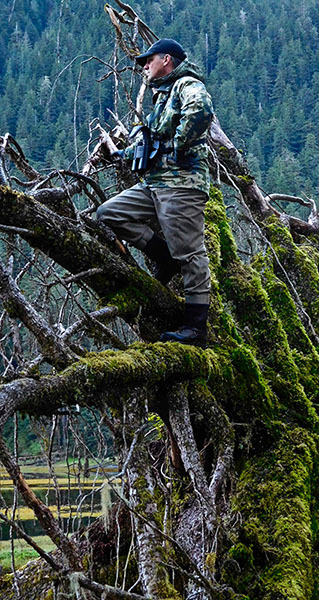 Keegan McCarthy and his excellent guides hunt a huge area in Alaska for black bear and brown bear, the latter primarily on Admiralty Island which reputedly has the highest Alaskan brown bear population in the world!